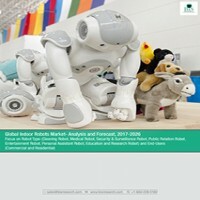 The indoor robots market has exhibited a high growth rate in the recent past owing to a number of factors such as increased adoption of robots among domestic users and growing needs of robots for security services. Furthermore, increase in R&D activities, rise in trend of connected home and internet of things (IoT), impending growth opportunities across developing countries are expected to create viable opportunities in the indoor robots market. Indoor robots have gained traction in recent years owing to their several advantages such as enhanced efficiency, less operating cost and ease of operation. Furthermore, growing demand for productivity and quality, rise in demand of robots for elderly care and growing demand of surgical robots are boosting the growth of the overall global indoor robots market. The major types of indoor robots include cleaning robot, medical robot, security & surveillance robot, public relation robot, education robot, entertainment robot, and personal assistant robot, among others. These robots are used across commercial and residential end-users. In commercial end-users the applications include, retail, banking, healthcare, hospitality and others. By analysis, the global indoor robots market generated $3,700 million in 2016, in terms of revenue. The study provides detailed analysis of industry attractiveness through Porter’s five forces analysis. The report also highlights the value chain of the indoor robots in the industry. A detailed competitive analysis has been included in this report which focuses on the key market developments & strategies followed by the key players in the market. Additionally, competitive benchmarking of the players providing different types of robots has been included which analyzes the positioning of the players in the market. The key market players are analyzed and profiled in detail in the report. This section covers the business financials, company snapshots, key products & services, major developments, and finally, the individual SWOT analysis. 9.10 Omron Adept Technologies, Inc.
9.13 SoftBank Robotics Group Corp.
9.15 Yujin Robot, Co., Ltd. Figure 9.10 SWOT Analysis – InTouch Technologies, Inc. Figure 9.15 SWOT Analysis – Intuitive Surgical, Inc. Figure 9.23 SWOT Analysis – Knightscope, Inc. Figure 9.30 SWOT Analysis – Omron Adept Technology, Inc. Figure 9.32 SWOT Analysis – Savioke, Inc. Figure 9.34 SWOT Analysis – Simbe Robotics, Inc. Figure 9.39 SWOT Analysis – SoftBank Robotics Group Corp. Figure 9.43 SWOT Analysis – TransEnterix, Inc. Figure 9.45 SWOT Analysis – Yujin Robot, Co., Ltd.
Indoor robots are the robotic systems which are developed to perform a specific task autonomously in an enclosed surroundings. These robots are majorly used across commercial and residential sectors. The robots developed for commercial and residential end-users are robust in design, ubiquitous and are reaching exceptional cognitive capabilities. Indoor robots work alongside humans in real world situation and accomplish the tasks that are assigned to them. The indoor robots that are assigned to different commercial end-users are healthcare, banking, retail, and hospitality, among others. These robots are usually used to perform applications such as cleaning, security, entertainment, assistance in daily work and interaction with customers in a store, among others. The indoor robots market accounted for a market value of $3,700 million in 2016 with medical robots holding the highest share. Medical robots hold a large share of revenue in the indoor robots market. The high share of these robots is mainly attributed to considerably high price of these robots and unprecedented rise in demand of these robots across different geographies. Besides that, rise in demand of cleaning robots is also anticipated to propel growth in the global indoor robots market. North America is expected to dominate the market during the forecast period which is followed by Europe, Asia Pacific, and Rest of the world. The U.S. is the leading country in the manufacturing of indoor robots for commercial and residential end-users. The country is home to two of the leading players in cleaning and medical robots market, i.e. iRobot Corporation and Intuitive Surgical, Inc. The U.S. accounts for a major share of revenue of these companies. Similarly, Asia Pacific is expected to grow at the highest CAGR with China dominating the market in this region. Some of the key manufacturers in the indoor robots market include: iRobot Corporation, Ecovacs, Intuitive Surgical Inc., SoftBank Robotics Group Corp., Aethon, Cobalt Robotics, Geckosystems International, Corporation, InTouch Technologies Inc., Knightscope Inc., NXT Robotics, Inc., Savioke, Inc., Simbe Robotics, Inc. TransEnterix Inc., and Yujin Robot Co., Ltd..